Now here in the 21st Century, I still feel close to St Peters. My forebears had already lived close by St Peters Church for over a century. When my parents married and settled in Nursery Street, in 1936; I was born there the following year. From our house No. 11, on the south side of Nursery Street the tower of St Peters can easily be seen from my back bedroom window, and during the euphoria at the end of the second World War a large cross was placed on top of the tower made up of electric light bulbs. I have never forgotten this wonderful sight illuminated against a dark sky. Sometime later I spoke to my Grandfather about this spectacle and he told me a similar interesting tale. 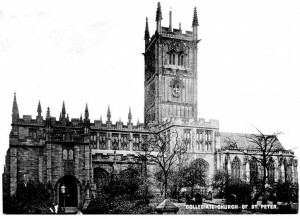 Around the mid 1800s when his own grandfather; was a small boy, living at that time; close to the top of Horseley Fields, he was awakened one night by a commotion in the house, it seemed that the whole of the tower of St Peters Church was on fire. As it turned out, what had happened was the wooden cross on the tower that supported the weather vane had been struck by lightening and caught fire. This fiery cross standing out against a dark sky, presented a spectacle he never forgot. Thank God; before it could spread to the beams, passing volunteers hacked through the cross and prevented the fire reaching the belfry and it was put out.